That quote perfectly describes how I feel about this book. I just want to tear this book into pieces and love them all to death. When I was reading the book I started by liking the characters and how they acted and then out of nowhere BOOM! I fell in love with them! 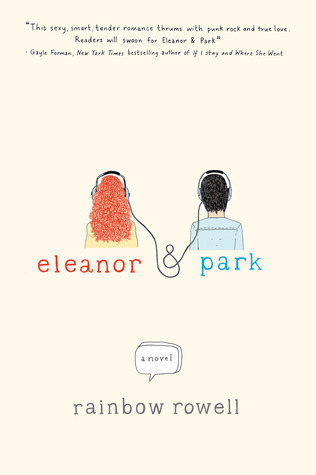 I kept on flipping through the pages like crazy, I had never before been so invested in some characters like I was with Eleanor and Park. Their love is just pure and innocent, it reminds me back when I had my first boyfriend and holding hands was a big deal. Their epic romance starts not with words but with silence. They communicate through comic books and music. And then it keeps on progressing. For the first time I read a book that it's about two normal high school kids falling in love in a VERY realistic way. It wasn't love at first sight in fact they had a rocky beginning, but that's what makes this book so amazing. Because it feels realistic, and the readers can relate to this book. I remember being in high school and being self-conscious, just like Eleanor. And Park being half Korean and half Irish and trying to figure who he really was, just like any other teenager in the world. I liked how the story was really realistic. It wasn't all about romance there was also family problems. But the only problem I had was with Eleanor's step father. Would an adult really do that? Right those things like a little kid? To me that was a little unbelievable. But over all I really liked this book so much and if you haven't read it I recomend that you go and read it right now.